Floor graphics are an exciting, modern way to advertise your product or event in a unique way that will get you the most purchases. Fortune 500 companies started the floor advertising phenomena, but now prices are such than most businesses, groups and organizations can afford to take their marketing to the floor. Custom Floor graphics are great at airports, grocery stores, discount centers, convention centers, auto dealerships, retail stores, shopping malls, and more. Floor graphics are digitally printed, so all the color you desire is available at the same low price. Floor decals can be cut into virtually any shape you desire, so you can choose from mild to wild in your design. Floor decals work on any smooth, non-porous flooring, such as vinyl, ceramic tile, marble, terrazzo hardwood, and even sealed concrete and sealed granite floors. There are a few more expensive floor wrap materials that can even be used on sidewalks and asphalt, though they are not for automobile traffic. Regardless of the material, floor advertising has come a long with with the invention of new slip resistant floor graphics. From an advertising standpoint, floor decals provide many more advertising impressions, as most floors are uncluttered and the percentage of people who look and read the floor graphics is often 5-10 times as many as would see your “ad” in a busy retail environment, lost amongst a variety of other posters, celing hangers, danglers, and the like. 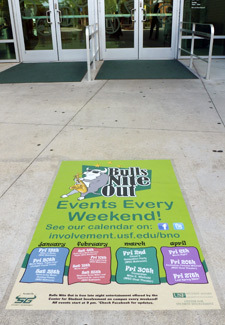 For this reason, floor graphics are a huge part of advertising strategies in areas where there is a lot of foot traffic. 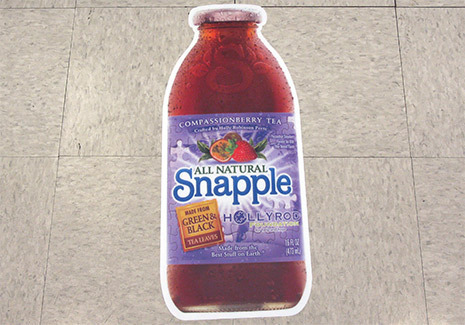 Adhesive floor graphics are ideal for short term promotions, driving retail sales higher at the point of purchase. Point of purchase floor graphics are unique enough to break through the clutter of in-store marketing campaigns. Floor decals are printed with modern techniques digitally, which means full color is the same price as 1 color. You want a photograph on your floor decal, no problem, we can design it, print it , and get you great looking floor graphics for less. Good Guys Signs uses high quality floor graphic vinyl from 3M, Mactac, and panoRama. All of our floor vinyls and over-laminates meet ASTM D2407 and R12 testing for slip resistance, or are B1 flame certified and/or ASTM E84 UL certified. Floor graphics have a non-skid over-laminate, and use special adhesive’s that grip the floor yet can be removed easily.